Lower (or lumbar) back pain is a very common problem, which the vast majority of adults will suffer from at some time during their lifetime. The majority of patient’s symptoms are from simple or mechanical back pain that will resolve within a few weeks of onset with appropriate physical therapy and analgesics. It may be the pain comes from the muscles, joints, discs and ligaments of the spine. This should be managed by the general practitioner and local physiotherapist, without requiring the advice of a spinal specialist. I have already had physiotherapy, why am I being sent to a spinal physiotherapy specialist? In a minority of patients their pain may not respond to these simple measures and this may benefit from further investigation and treatment. The initial assessment and treatment may be performed by a spinal physiotherapy specialist. Spinal physiotherapy specialists have undergone specialised training and only treat patients with spinal problems, consequently they are extremely good at assessing patients spinal problems and arranging appropriate investigations, including MRI scans if these are indicated. Physiotherapy specialists work closely with the spinal surgical team and this means that a patient can be assessed rapidly if surgery is required. Very occasionally back pain can be related to serious underlying problem such as infection, tumours or fractures. Patients with these problem may exhibit features of ‘non mechanical’ back pain whereby the pain is constant and unrelated to increased activity. 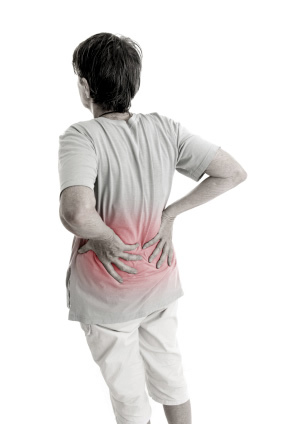 The so called, ‘Red Flag Signs’ are used to help identify people who may have one of these causes for their back pain. Do I need to see a spinal surgeon? If the back pain becomes persistent or a patient has red flag signs then further assessment by a spinal specialist and investigation of the spine may be required. When indicated a referral to a Spinal Specialist can be arranged by the patient’s General Practitioner, within the NHS this usually will involve seeing a spinal physiotherapist initially and then review by the specialist when required. Following appropriate assessment by the spinal specialist further investigations investigation may be required. MRI scans are commonly used to investigate the spine although other tests such as X-rays or CT scans may also be used. See MRI scan. MRI scans of the lumbar spine are extremely sensitive. Scans may show changes that are due to natural aging of the spinal column, with almost everyone having such changes on their scan in middle age. These changes do not indicate disease and may not be the cause of the pain. Incorrectly attributing these symptoms to a normal age related change on the MRI scan we could lead to inappropriate treatment. MRI scans are extremely sensitive at identifying or excluding serious causes of back pain. Treatment options then depend upon the severity and duration of the symptoms as well as the underlying cause. Changes seen include facet joint arthritis, degenerative disc disease and spondylolisthesis. Treatment options then fall into three main categories. Performed by physiotherapists, chiropractors or osteopaths the vast majority of patients will improve with these treatments. See Physiotherapy. The source of the pain may be the degenerate discs or the facet joints. Under these circumstances the pain may be improved by and epidural injection or facet joint injections. See Injection Therapy. The vast majority of patients with back pain will not require surgery. Some patients will experience persistent spinal pain despite these measures. Under these circumstances spinal surgery may be indicated. Surgery should only be undertaken following a period of conservative treatment and following discussion with the treating Spinal Surgical Specialist who will be able to discuss the benefits and risks of the different treatment options which include fusion surgery, disc replacements or other forms of dynamic stabilisation. See Spinal Fusion. Some patients will have persistent back pain despite treatment with physiotherapy and injection treatment. Unfortunately these patients may not gain benefit from injection treatment or surgery. Following assessment by the spinal specialist they may then refer you to a pain specialist. These are anaesthetists who specialise in pain management techniques.